WAG Heating Services are well established Middlesex plumbers providing a full range of domestic plumbing, heating and gas services, from boiler work to gas and central heating work. If you’re looking for a reliable Plumber in the Hillingdon Borough and surrounding areas, then you can be assured that we will offer you the best service and unbeatable value for money! Take a look at some of the services we offer and if you need any more information please contact us and a we will be happy to help! Leigh and his team provided an excellent service throughout, with helpful intuitive ideas. The team was very friendly, polite and considerate, nothing was too much of a problem for them. I would highly recommend WAG Heating Services and shall definitely be using them in the future. An excellent job undertaken quickly and effectively and with minimum inconvenience. Having whittled down my original shortlist of contractors, I finally chose WAG Heating Services and have not been disappointed. Leigh impressed me from the outset with his excellent product knowledge, professionalism, and accommodating and flexible approach. The work was started within a couple of days from Leigh’s initial visit to view the job and completed within the day, as estimated, despite my adding 2 additional replacement radiators to the job. Leigh calmly took on board these last minute additions without any fuss or consternation. The job was finished to an high quality, on time and to the quoted estimate. Leigh’s communication has been excellent throughout and he has since checked back that all is well. I would definitely use WAG Heating Services again and would not hesitate to recommend them. 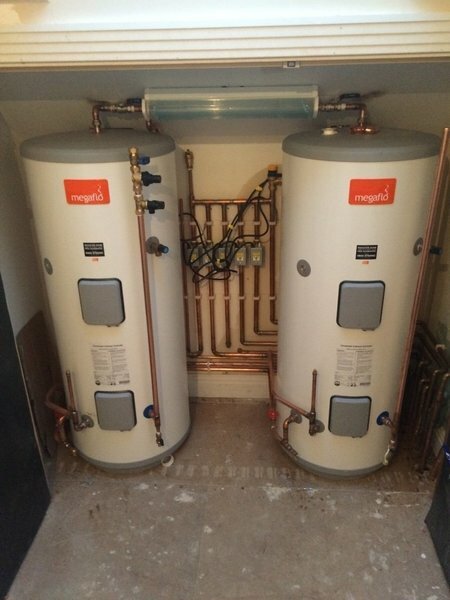 Leigh and his team installed a new cylinder and boiler. From the initial consultation right through to the final hoovering they did the job extremely efficiently, arrived when they said they would and left the house in good order. Most importantly, they were pleasant and unobtrusive to have around the house. I was also very impressed with the way Leigh itemised the cost of every aspect of the job in his written quote and the cost of any variations/additions/upgrades I might want. They were also very professional in dealing immediately with guarantees, gas-safe certificate etc. I would use them again and have no hesitation in recommending them. We have used WAG for both plumbing and gas work - they have always provided a professional, excellent service, always polite and efficient - have no hesitation in recommending them for replacement boiler or plumbing works, we have not had any problems with the works they have done for us. We are lucky to have come across them. I’ve had Lee and Stuart do a few pieces of work including repairing and electrical fault on a boiler and fixing a leaking immersion tank. In all cases they kept to their word about the call out to check the problems, explained step by step what the issues are and how they would fix it, and got the job done quickly. All for a fair price. The work has been of a high standard and the problems, once fixed, have not recurred. I am curious and ask a lot of questions about the systems and they have always been excellent at talking me through things systematically to help my understanding. Leigh serviced my boiler and unvented cylinder pointing out things should have been done and recommendations to have a system running efficient and reliably economically as possible. I would recommend them with no hesitation. Excellent service and very nice men. WAG have been excellent right from the first quote to follow up on the completed job. Quotes were spot on no hidden extras and above all work was completed exactly as scheduled and planned. Great quality work and highly recommended. As well as completing my boiler installation they completed my parents installation who are elderly who found Leigh and Stuart patient and accommodating and above all reassuring in their dealings with them. Overall highly rated great professionals who deliver exactly what they promise and maintain a high degree of professionalism in their approach by giving trustworthy advice. There was no hard sell or surprises in the final bill which was very very competitive having shopped around with a number of other installers. Leigh and Stuart removed an old boiler and installed a new Bosch Worchester one. I am very pleased. They quoted within the day, and juggled their schedule to fit mine to install the new boiler. They also installed a Nest thermostat, a filter and tidied up all my wiring in the boiler room. I would recommend them with no hesitation. Excellent service and very nice men. Found WAG on Worcester's website as I wanted an authorised installer to replace my aging combi with an unvented cylinder & system boiler. After getting a few quotes we settled on WAG based on their detailed, competitive quote and the knowledge, enthusiasm and attitude of Leigh (who runs the business). So glad we did as we're extremely happy with the results. We now have a heating system which has clearly been installed by someone who takes pride in their work and runs like a charm. Nice work gents! Solved a problem on my Worcester Bosch boiler which had leaked. No teeth sucking, just good advice and quality workmanship at a fair price. I would use again and recommend.